Beard oil is a combination of carrier oils and essential oils. It is used by applying it to your beard in order to soften the beard hair and moisturize your skin. 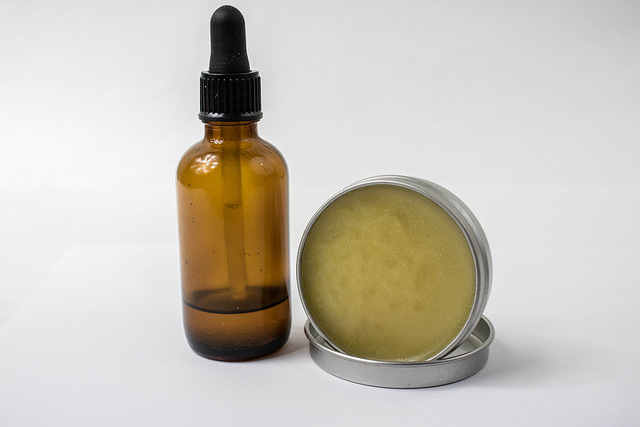 Beard balm can be made from a variety of ingredients, commonly including oils, beeswax, and butters. It can have a nourishing effect for beard hair but has a more practical use as a styling product for beards. Beard oil is made from combining natural oils. At least one carrier oil is necessary as the base of the product. Carrier oils, like jojoba oil and coconut oil, are gentle on the skin. They also dilute any added essential oils for a safe and even application on your skin. Beard oil can be made entirely from carrier oils, but usually has essential oils as well. Essential oils are concentrated extracts from plants that are usually too harsh to apply directly onto bare skin. A small amount of essential oil can be mixed with a carrier oil, adding fragrance and potentially other benefits like antimicrobial properties. 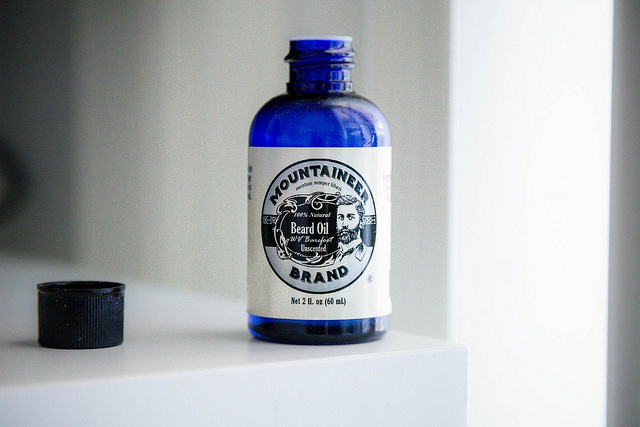 Beard balm, like beard oil, begins with oils. However, the balm usually also contains a kind of vegetable butter and wax. Shea butter is a common example of a vegetable butter used in balms and helps make the balm easy to spread. Beeswax is the most common wax found in balms and gives the balm some hold to keep beard hairs in place. Beard oil is primarily a moisturizer or conditioner. The oils soften beard hair and moisturize the skin beneath the beard. Some people also use beard oil as a fragrance and to create a matte finish to their beard. Beard balm is a conditioner and a styling product. As with beard oil, the oils and butters in balm nourish both hair and skin. The beeswax in balm holds the beard in place. Beard balm can also be used as a fragrance. Beard oil is completely liquid and has a much lighter texture than beard balm. Once it dries, you can’t normally feel any residue. Depending on the outside temperature, beard balm may be solid or liquid. Usually, it comes as a solid and must be warmed up by rubbing it between your hands so that it can be spread evenly on your beard. While the oil and butter should absorb into the hair, the wax will likely leave some hard residue behind, which holds the beard in place. Beard oil can be used on any length of hair but might be preferable to beard balm on short beard hair. Short beards usually don’t need the hold given from balm, and because dry skin is more visible with a short beard, beard oil can be used as a fast and effective moisturizer. Beard balm is well-suited for longer beards that need a product to hold their style in place. People with short beards can also use beard balm to tame and conditioner unruly hair. Hair naturally soaks up oils, so beard oil dries quickly after application. This tends to give a beard a matte finish (as opposed to a glossy or shiny finish). Because beard balm contains thick butters and wax, it is not absorbed nearly as fast as beard oil. Also, the beeswax will dry but may not absorb into the hair. As such, beard balm typically leaves a beard looking glossy. While beard oil can be used on both oily and dry skin, some people with oily skin may find beard oil preferable to balm. Oily skin is often sensitive to thick products like butters, and some carrier oils can reduce the appearance of oily skin. As a moisturizer, beard oil can be used on dry skin as well. Beard balm is a thick moisturizer, making it ideal for dryer skin. If you have oily skin, you will need to test beard balm to see whether it makes your skin too oily. Beard oil and beard balm are two complementary options for conditioning beards. They can be used together or separately depending on your needs. Beard oil is a mixture of carrier and essential oils, while beard balm is usually oils, vegetable butters, and beeswax. Beard oil is primarily a conditioner and fragrance, while balm also works as a styling product. In its solid form, beard balm applies thick and leaves a glossy residue that acts as the styling agent. Balms are especially effective on dry skin which needs a thick moisturizer. As a liquid, beard oil is absorbed quickly and leaves a matte finish. It’s optimal for short hair that doesn’t need styling. Kelsey Robarts. "Differences Between Beard Oil and Beard Balm." DifferenceBetween.net. 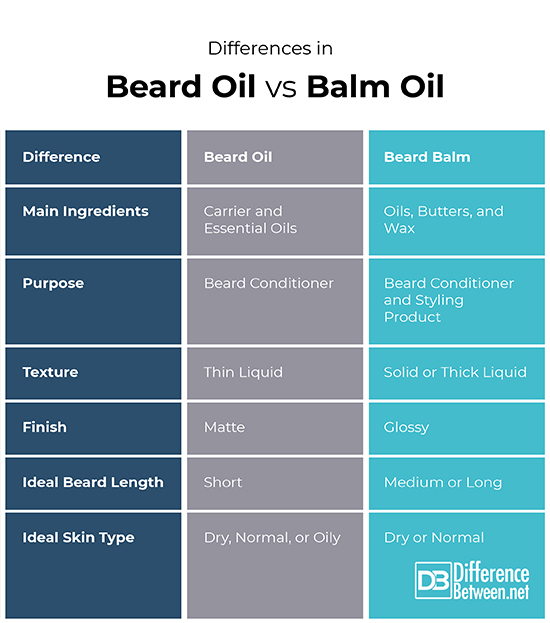 December 3, 2018 < http://www.differencebetween.net/miscellaneous/fashion-beauty/differences-between-beard-oil-and-beard-balm/ >.